Today, believers around the world call on the name Jesus, but many of them find it difficult to understand the true nature of Jesus. Some consider Jesus as an ordinary man. Still others say He’s simply “God’s Son” and deny His divinity. However, the Bible explains that God the Father, God the Son and God the Holy Spirit are all one and the same Almighty God. This is called the Holy Trinity. H2O, for instance, can take on three different forms: liquid, solid and gas. When H2O’s liquid form, water, freezes it becomes solid, ice. When water boils it becomes gas vapor. 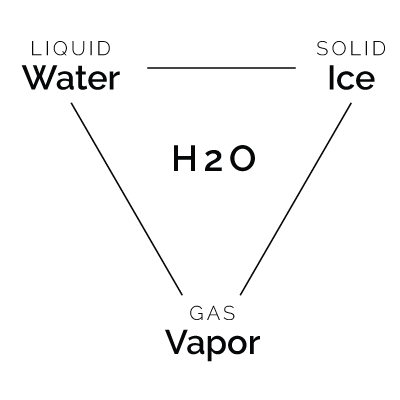 Though the three phases have different names and appearances, they still retain the same H2O essence. 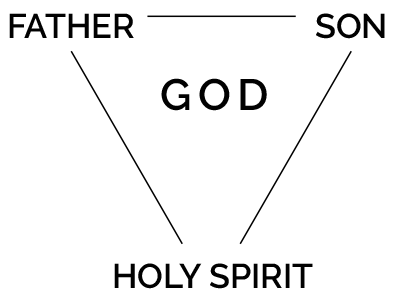 Likewise, God plays three different roles in the Trinity, having three different names and appearances, while maintaining His nature of God in each role. The Bible explains that God the Father, God the Son and God the Holy Spirit are all one and the same Almighty God. Through a prophecy in the Old Testament, the Bible clearly states that God the Father Jehovah and God the Son Jesus Christ are the exact same in essence. The “child” and “son” here is Jesus (Lk 1:31). Every Christian is aware of this. Through the honorific titles, “Mighty God” and “Everlasting Father,” it’s understood that this is no ordinary child; it’s God the Father Jehovah prophesied to be born in human form. By saying, “I and the Father are one,” Jesus was letting the Pharisees know that He Himself was God the Father. Sadly, the Jewish teachers of the law failed to recognize the true identity of Jesus Christ. The Apostles, on the other hand, were able to realize the divine nature of Christ. … Christ himself was an Israelite as far as his human nature is concerned. And he is God, the one who rules over everything and is worthy of eternal praise! Amen. “God” coherently refers to God the Father throughout the Bible. Apostle Paul, the writer of Philippians and Romans, testified that God the Son Jesus is in very nature God, indicating that He is God the Father Jehovah, who was born in the flesh. Though he was God, he took the humble position of a slave and was born as a human being. The apostles and the prophets also make it clear that God the Father and God the Holy Spirit are one. The Spirit searches all things, even the deep things of God. For who among men knows the thoughts of a man except the man’s spirit within him? In the same way no one knows the thoughts of God except the Spirit of God. But God has shown us these things through the Spirit. The Spirit searches out all things, even the deep secrets of God. Who knows the thoughts that another person has? Only a person’s spirit that lives within him knows his thoughts. It is the same with God. No one knows the thoughts of God except the Spirit of God. Only God Himself can know the thoughts of God. However, the Bible says the Spirit of God – the Holy Spirit – searches even the deep things of God. This proves God the Father and God the Holy Spirit to be the exact same entity. This is not a contradiction, but a testimony that proves God and the Holy Spirit are one. The Bible says all scripture was inspired by God. Another part of the Bible explains prophets wrote as they were moved by the Holy Spirit. This is not a contradiction, but a testimony that proves God and the Holy Spirit are one. Through the book of Romans, we can see that God the Son and God the Holy Spirit are the same entity. Who then is the one who condemns? No one. Christ Jesus who died — more than that, who was raised to life — is at the right hand of God and is also interceding for us. It is written that the Spirit himself and Christ Jesus intercede for us. The Bible continues to explain Jesus and the Holy Spirit are one through Their titles. In the book of Isaiah, Jesus was prophesied to bear the title of “Counselor.” The “Counselor” also refers to God the Holy Spirit. Jesus told His disciples that the “Counselor” was in fact the Holy Spirit. Since God the Son and God the Holy Spirit are both described as the “Counselor” it means that They are one and the same. In speaking this way, Jesus meant that He would return as God the Holy Spirit to reteach all the truth of the Bible. God the Son and God the Holy Spirit are surely one. Jesus’ last message to His disciples was to accomplish the work of salvation through the Trinity. God’s prophets are to baptize people by calling out the three names of the Trinity . The name of God the Father is Jehovah and the name of God the Son is Jesus. In accordance with the Bible, God the Holy Spirit must also have a name.  The name of the Holy Spirit is Ahnsahnghong. Ahnsahnghong is the Holy Spirit because He fulfilled the prophecy of the one to come and remind us of the truth Jesus taught. So God the Holy Spirit Ahnsahnghong is God the Son Jesus Christ. By saying this, Jesus gave the Holy Spirit a gender and a persona. It’s because, being one in the Trinity, God the Holy Spirit must be masculine just like God the Father and God the Son. This is why the Holy Spirit appeared as a man. By clearly understanding the Trinity and the three names of God, we can confirm we’re on the right path to salvation.